We took a little family vacation to Moab, UT this past weekend. We visited Arches National Park and Dead Horse Point. We spent some time going on a few family bike rides and seeing a few touristy things in the area, too. 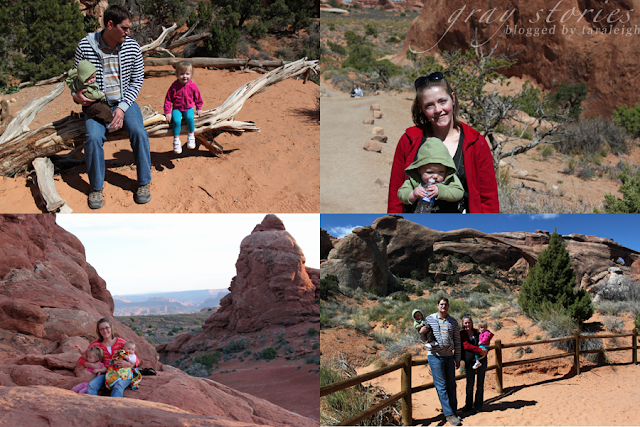 We drove into Arches 3 times to see different parts of the park. 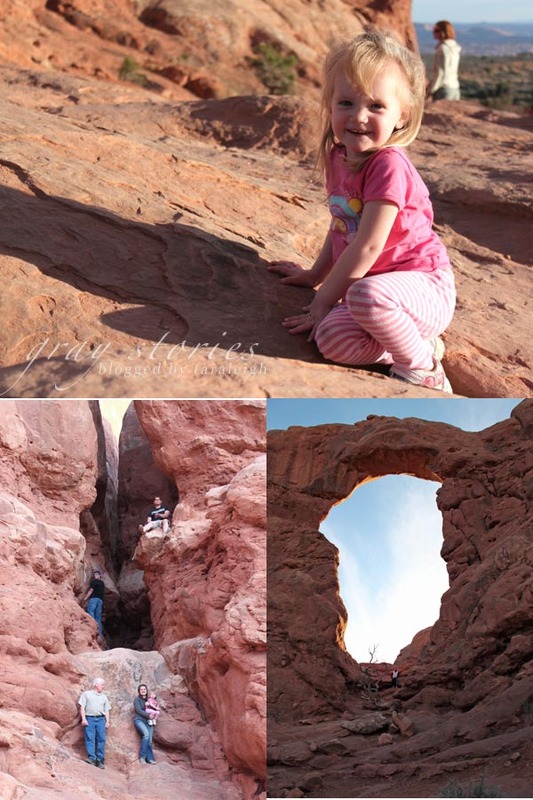 I have been to Arches a few times before, but every time is still fascinating for me. The weather was overcast+rain on one day, cold+windy the next, and finally blue sky+pleasant for the last day. We saw a good portion of the park, as much as was possible with little children in tow. Liliane wasn't feeling well the first 2 days, but the last day we were in Arches she had a blast climbing and walking. She's a little hiker! This was the first trip we've gone on since Liliane's been potty trained. Well. It was a little tricky. On the first day we were there we left in such a hurry to get into Arches that we didn't bring any of her extra clothes with us. Naturally, since we weren't prepared, she had an accident. SO... we improvised! 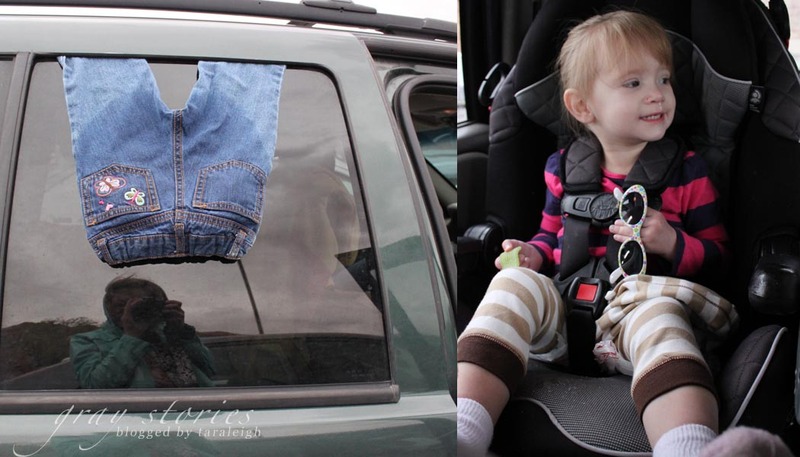 We hung her pants out the window to dry and put one of Wesley's sweaters on her for pants. At least we have some comical memories from the trip. 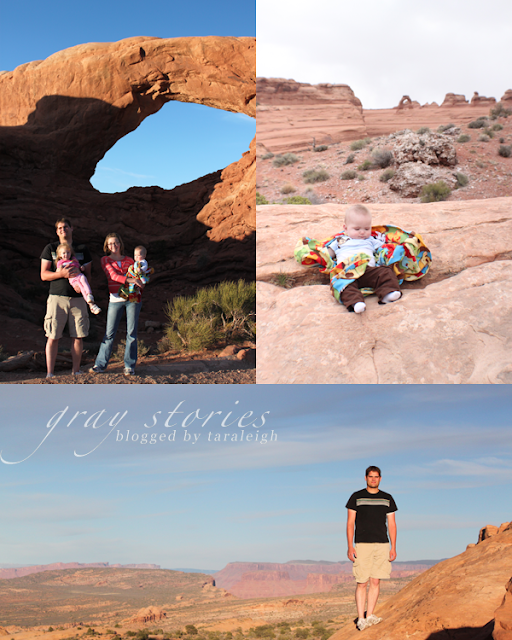 We stayed in a condo in the southern part of Moab. There were 12 people with us total, 8 adults and 4 children. We went on two bike rides, the first of which was a bit irritating (Jordan's petal flew off his bike without warning, leaving him frustrated and in pain that only a man can empathize with), but the second little ride we took went a lot smoother. 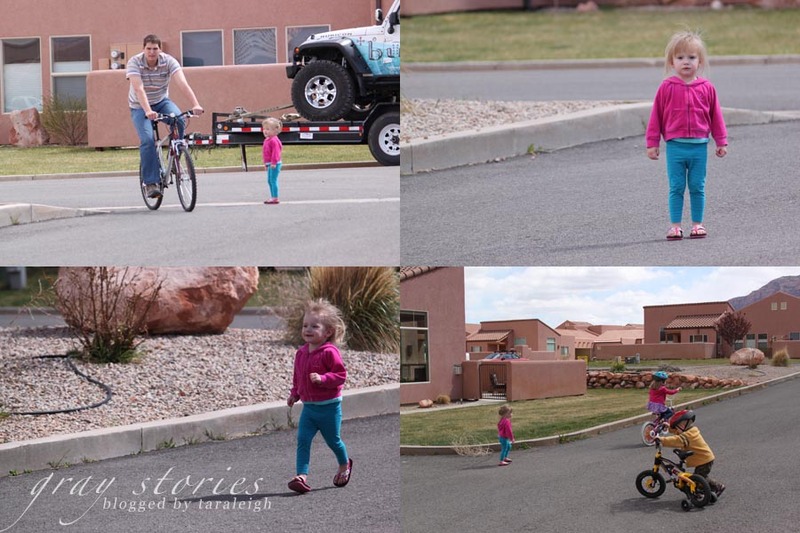 We put Wesley and Liliane in a bike trailer that Jordan towed on the back of his bike. Once the kids got used it riding in it they enjoyed themselves. 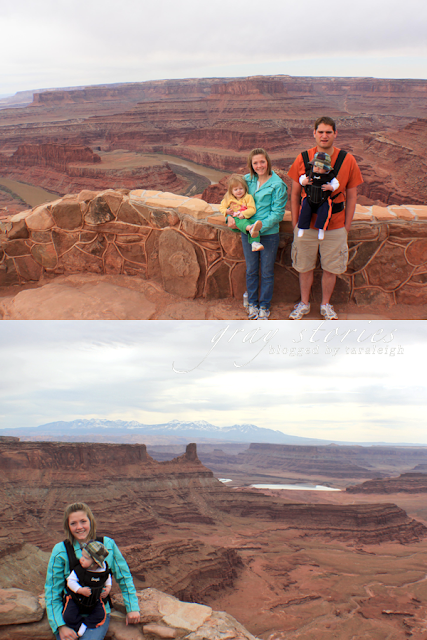 On Tuesday, before we headed home, I wanted to pay a visit to Dead Horse Point, one of Utah's state parks. It was 45 minutes in the opposite direction of home, but after being there and seeing the breathtaking vista I absolutely don't regret the extra time in the car. 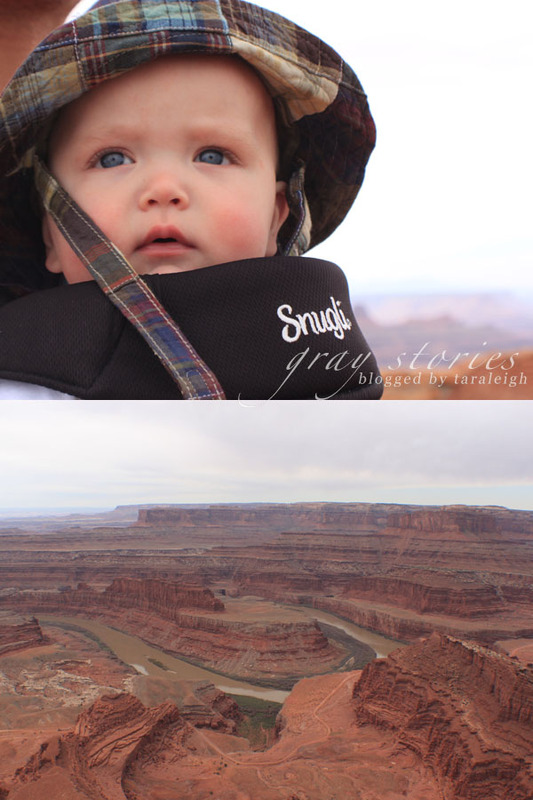 "The legend of Dead Horse Point states that around the turn of the century the point was used as a corral for wild mustangs roaming the mesa top. Cowboys herded them across the narrow neck of land and onto the point. The neck was then fenced off with branches and brush. One time, for some unknown reason, horses were left corralled on the waterless point where they died of thirst within view of the Colorado River 2,000 feet below. " It's crazy that the Colorado River is responsible for creating this amazing landscape. We made it home from our trip Tuesday afternoon and were happy to be home. Jordan decided that we'll visit Moab a lot because he loves it there. "There's just so much to do!" he says.